Have you been wanting to give the Ivy Granger series a try, or are you a mega fan wanting more stories from the monster-filled streets of Harborsmouth? You're in luck. 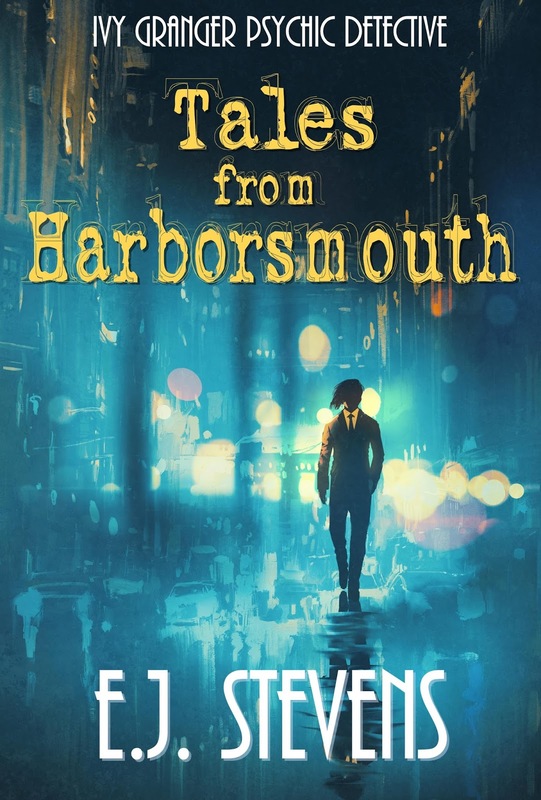 Tales from Harborsmouth, an Ivy Granger series collection with two novellas and two exclusive short stories, is now available for pre-order. More Ivy, Jinx, Marvin, Sparky, Forneus, and Torn! Are you excited? We are, and we're celebrating with an awesome giveaway. So grab some cake and pull up a chair. It's time to party! Tales from Harborsmouth (Ivy Granger #0.5, #1.5, #2.5, #5.5) by E.J. Stevens. 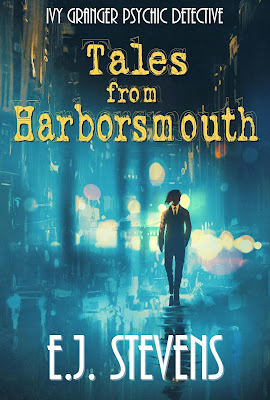 Tales from Harborsmouth is the first time the Ivy Granger novellas are in one collection and features two exclusive short stories the series prequel Frostbite and the newest Ivy Granger tale Thrill on Joysen Hill. In this Ivy Granger prequel, join Ivy and Jinx on a disturbing case that leads down a dead end alley to a house ravaged by time and circumstance. Few places are as rife with opportunity or as fraught with danger as Harborsmouth's notorious Joysen Hill. Vampires own the real estate, and even the most ruthless human thugs won't venture out after dark, but when Torn gets stuck babysitting, he can only think of one place in Harborsmouth interesting enough to take a demon toddler, a teenage bridge troll, and a grouchy hearth brownie. What happens next substantiates the city's advertising slogan. No matter who or what you are, no matter how young or old, you can find your thrill on Joysen Hill. How's the cake? Ready to win some great prizes? We are giving away an Ivy Granger Prize Pack, including a $25 Amazon Gift Card and *signed* collectible Passport to the World of Ivy Granger. To enter, please use the Rafflecopter from below. This giveaway is INTERNATIONAL. Giveaway ends June 13th midnight EST. In the Ivy Granger prequel story FROSTBITE, Ivy's client claims that her house is haunted. Do YOU believe in ghosts? Some things are just too good to not believe. I'm sold. Yes. I do believe in ghosts. No, I don't believe in ghosts. My mother has seen a ghost, so yes I do believe. No, I don't believe in ghosts but it's fun to read about them. I do not believe in ghosts in real life...I do believe in ghosts in good stories! Yes I strongly believe in ghosts. I totally believe in ghosts. In fact, I lived in a haunted house as a kid. The neighbors said no one ever stayed. We immediately understood why and moved within a month. absolutely don't believe in ghosts. haha sorry. No, I don't believe in ghosts. I have to see to believe. I believe they exist, and I am not interested in ever running into them. I do believe in ghosts! No I don't believe in ghosts. Yes I do believe in spirits/ghosts. I haven't seen any myself but weird things have happened that can't be explained. Guess my answer is I'm open to the idea of it. I do believe, there is too much unexplained to not be a believer. I'm on both sides of the fence here. Usually I don't believe in ghosts but there are definitely times when I'm not so sure. So I'm going with no and maybe, best I can do. While I don't believe in ghosts, per se, but I've experienced too many strange things to totally discount the possibility of something there. I think part of me actually wants to believe in them (not the mean, angry ones, but the ones who comfort those they left behind and warn people of impending doom so it can be averted). I'm skeptical, but I don't completely disregard the possibility that ghosts exist. Demons I have no doubt exist. Whether or not accounts of ghosts are actually demons, I don't know. Possibly. Once I see one, I'll know for sure. I don't believe in ghosts. I think there are other supernatural forces that try to manipulate people, such as negative entities like demons. Sort of. I've seen some things that could be related to ghosts. But I'm also a believe it when I see it kind of person. I absolutely believe in ghosts.... but they are always more interesting in fiction. I'd like to, but no. I'd like to believe it ghosts, and have had some weird encounters in the past that have left me unwilling to shut down the possibility entirely, but I'm still skeptical. Thanks for the chance! Yes I do believe in ghosts. Yes, I do. And I have my reasons to. I believe in the possibility of ghosts or spirits but I havent seen one Possible felt a cold thru my body more like a presence nothing evil or bad just a chill and a feel of familiarity? I had an incident as a child, so I do believe in ghosts. I do no believe in ghosts, but I do believe in the Holy Spirit. No, I do not believe in ghosts. I don't believe ghosts exist. Yes, I believe, and I've seen a ghost. I do believe in ghosts, but they are not here to hurt us. I don't believe in ghosts. When I was younger, I did. I'm wishy washy about ghosts. I believe in all kinds of spirit things. I still sleep with a light on. I would like to, but no. I definitely believe in ghosts. Naw, I love reading horror stories about them though! NOTE: This giveaway is now over. But don't worry! We're having one more pre-order party giveaway this month. Stay tuned for details.